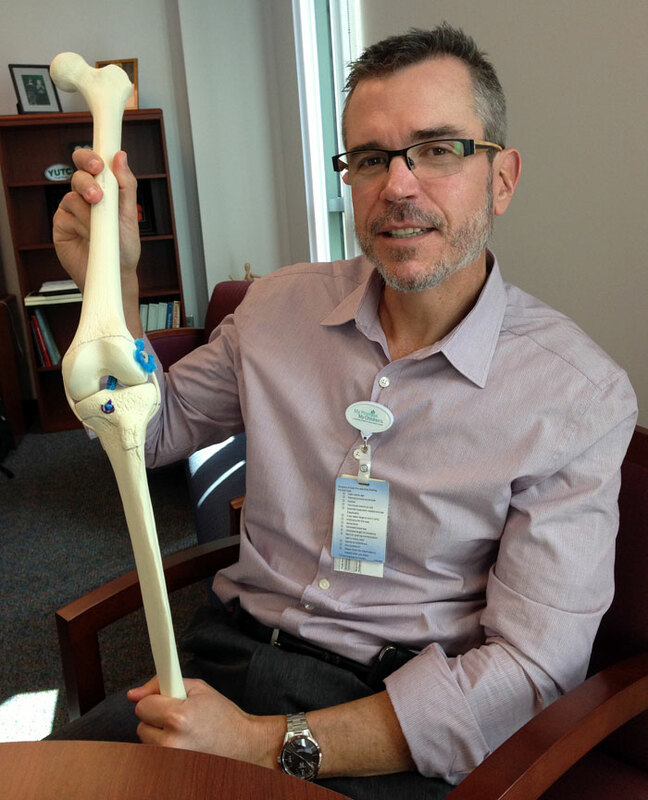 Dr. Jones holds a model of a knee featuring an ACL repair. As a result, surgical repair of the ACL has been a routine procedure – if the athlete has reached puberty and stopped growing. But that’s not the case with athletes 13 years old and younger. Doing an ACL repair on a girl or boy whose growth plates haven’t closed can cause growth disturbances in the leg. These athletes are typically sidelined from their sport for several years. Dr. Kerwyn Jones, chairman of the department of Pediatric Orthopedic Surgery at Akron Children’s, is one of six orthopedic surgeons in the country working with a company called Orthopediatrics to develop a new surgical technique to safely perform ACL surgeries on skeletally immature patients. A close-up of the new instrumentation for an ACL repair for young athletes who are not fully grown. After testing the new technique on cadaver knees and getting FDA approval, 11 patients have undergone the surgery. Dr. Jones performed the second and third in October. The number of young athletes with ACL injuries has increased over the past 20 years with the growing number of children participating in competitive sports at an early age and more intense levels of training. The injury is most common among soccer, football and basketball players, and girls seem to be at higher risk than boys. The ACL helps stabilize the knee and keeps the tibia (lower leg) from sliding forward in relation to the femur. It helps restrict excessive knee extensions and protects the cartilage “shock absorbers” of the knee from damage while jumping, pivoting and making quick changes in direction. “It’s hard to see kids not return to the sports they love. Children, by nature, are and should be active,” said Dr. Jones. Leg length discrepancy and deformity are significant risks for patients who have standard ACL surgery before their growth plates have closed. Until now, the best advice given to young athletes with ACL tears was to wear braces, undergo rehab, and restrict their activities. This new system, developed in conjunction with surgeons such as Dr. Allen Anderson (Nashville) and Dr. Mininder Kocher (Boston), avoids the growth plates and focuses on the epiphyseal area of the bone, allowing surgeons to treat the full spectrum of developing patients, from skeletal immaturity to maturity. The surgeon drills and reams the tibia and then the femur. A sleeve is inserted into the femoral tunnel and the soft tissue graft (typically two of the patient’s hamstrings) is passed through the femur and looped in the tibia. Newly invented devices – an ArmorLink fixation on the tibia and a ShieldLoc screw on the femur – secure the graft. 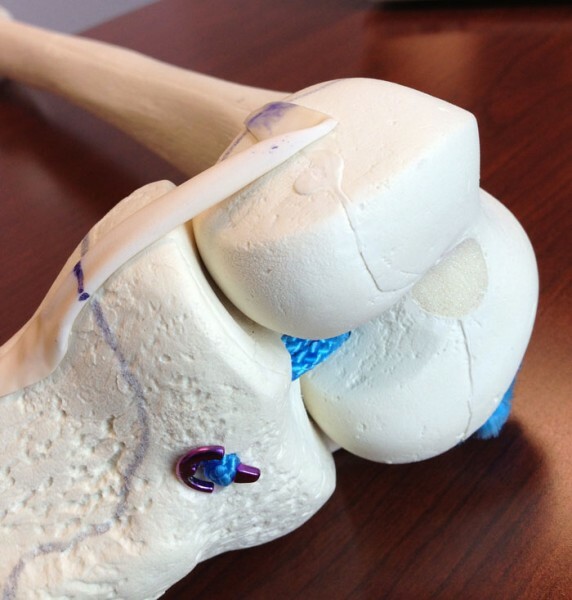 Early evidence in children treated with this same technique prior to the development of this instrumentation shows the “all-epiphyseal ACL reconstruction” provides excellent biomechanical stability and very good clinical results. The first 11 patients treated with this safer instrumentation – and those who follow them – will be tracked over time. Dr. Jones and his colleagues are developing a surgical algorithm to bring a uniform approach to treating adolescents with ACL injuries. This would take into account the patient’s skeletal and sexual maturity. The proposal recommends the new surgical technique for boys under age 13 and girls under age 12. “Like any surgery, our goal is to make this surgery safe, easy – with reproducible results – and available to kids everywhere,” he said.